This affordable beachfront condo is located 'Right on the Beach'. It offers fantastic views of the Gulf from two directions as it is located on the East corner of the high-rise building, so you can enjoy both sunrise and sunset from your private beach side balcony. The unit is on the second floor above the beach. This high-rise is located between the pristine Gulf Island National Seashore, and the Florida State Park Beach, both famous for gleaming white sand beaches. The location is convenient to several great restaurants, shopping areas, historical interest sites, and amusement areas. The unit features a large bedroom w/King bed, plus a fold-out couch in the living room to sleep 1 adult, and there are two built-in 'Captain's bunks' for 2 small children (3 -12 years old). This unit is luxuriously furnished. GRANITE COUNTER-TOPS! The kitchen is fully equipped with microwave, dishwasher, refrigerator w/ice maker, convenience appliances, tableware and cooking utensils. All linens provided. Hairdryer, iron and ironing board, are in the unit. You will find Washer/dryer in the unit (compare to 'Laundromat facilities' in other condos. Free high-speed Wireless Internet connection, 2 Cable LCD TVs, and DVD players. The unit has a private beachfront balcony with table & chairs. Seasonal Heated Pool, equipped exercise room, and outside BBQ grills. NO SMOKING (inside the unit), and NO PETS ALLOWED. 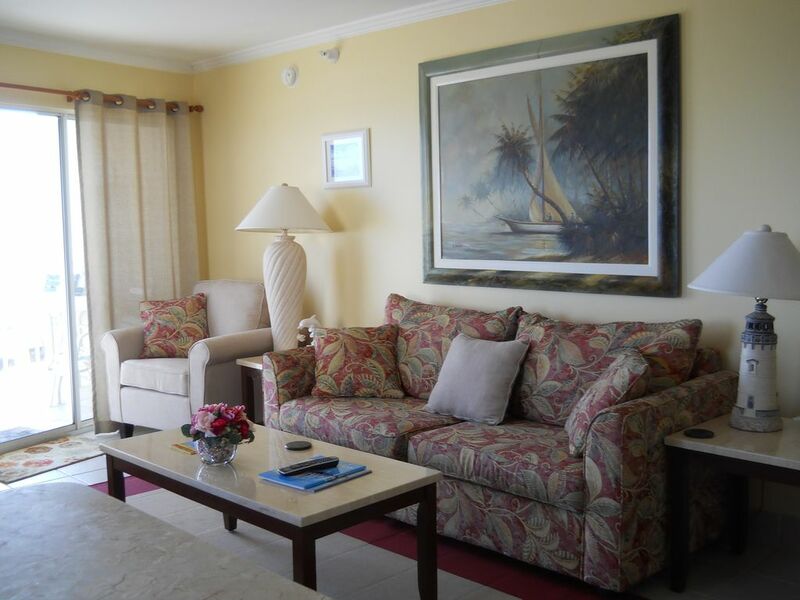 Just add family: fantastic oceanfront condo fully equipped for a week of fun and relaxation. We enjoyed our stay so much. The condo has everything you could possibly need; microwave, toaster oven, multiple place settings, a beach umbrella, washer/dryer, extra blankets, body wash, extra tp. We were very comfortable and enjoyed the pool and the beach. The condo is located close to Pensacola and its wonderful beach, or you can stay at home and enjoy the more private one in back. There is a Publix nearby for groceries. We stayed when there were a lot of families staying for spring break. The noise level was pretty intense for a few nights, but that is not the condo owner's fault. We would stay again in a heart beat. Thanks for your thoughtful touches for a great stay. Everything we needed was there. Place was clean, bed comfortable and overlooked the ocean What’s not to love? This condo is perfect , loved the decor. Feels comfortable and like home as soon as I walked in. My husband and I really love this condo, the condo itself is perfect as is the location , and beautiful view of the ocean. This is our second stay here and it's going to be the place we stay whenever we come to Florida . We are planning to come back in October or November . I recommended it to my sister who is going in April for a week stay with her husband.. Thanks for sharing your beautiful place with us. Tina was very good to work with. Condo was clean , had plenty of liens. Would rent again. Excellent customer service and lovely condo. Will happily stay again. Hope for more sunshine instead of rain for our next visit! Tanger Outlet Center, Adventure Island, Waterville water park, Ala. Gulf Breeze and Gulf Coast Zoos, Bellignrath Gardens, Big Lagoon State Park and Johnson Beach National Park, Ft. Pickens and Fort Barrankcas, Naval Aviation Museum, Historic Pensacola Village, U.S.S Alabama Battleship, several Golf courses, Deep Sea Fishing, Para-sailing, Jet Ski and Boat Rentals, and SCUBA diving. Don't miss the free Navy Blue Angles precision flight shows on Tue. & Wed. ! A list of activities restaurants, and shopping locations is available upon request, and located in the apartment.